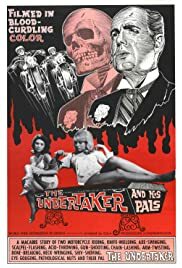 An undertaker and his two friends, who are restaurant owners, drum up business by going out on the town and killing people; the restaurant owners use parts of the bodies for their menu, and the undertaker gets paid by the families to bury the remainder. Their racket goes awry when 2 detectives suspect that something isn't quite kosher. So my friend decided this was the movie of the evening to watch. I like horror films and I like horror films with some comedy. They do not list this as a parody. In all honesty though…it really was a comedy with some bloody parts and some creepy men riding around. The story follows these three men who are hunting people down for their restaurant and morgue services. Honestly…a clever idea that ensures money made and money saved. Clever, brutal men. But yes, this was pretty bloody and scary, especially for the time period. I believe it was in the 1960s that this came out. I found it more creepy and funny at the same time. The film doesn’t take itself too seriously. There is melodrama, ridiculous scenes, stupid jokes, and hilarious moments. Ooooo Leg of Lamb….my goodness. The most hilarious part was when one of the men was chasing a girl up some stairs. I won’t say more, but I was on the floor! A silly, but creepy old-time movie. A good one for Halloween if you need a lighter horror film that will make you chuckle. I’ll give this 5 stars. Why? It was stupid, but perfect in every way! Sounds like a fine comedy! Yess! And it is a freebie so it works!